If you’re looking to create a simple website, and have basic needs re blogging, editing and ecommerce, Fasthosts may offer the service you need. The Fasthosts Website Builder service offers you two free trials. ‘Essentials' gets you a free domain (.uk, .co.uk, .com, .website or .club), email, SSL certificate, 25 templates to choose from, allows you to create a maximum of 10 pages, and access to a free stock image library, currently for £4.99 ($6.53) per month. ‘Complete’ covers all of the above, with an increase to 100 templates, an unlimited number of pages, SEO tools and an online store with multiple means of payment, for £9.99 ($13.06) per month at the time of this writing. For the purposes of this review, we took a look at ‘Complete’. Although you have to hand over your credit card details, the trial is free for the first 3 months for ‘Complete’, and 1 month for ‘Essentials’, which is more than long enough to get to grips with everything the service has to offer. The moment you’ve handed over your details, you’re encouraged to set up your package, and that includes registering a domain name. If you already have one, you can click on “Use a domain registered with another provider”, otherwise you need to get one there and then. You can’t continue on until this is done. Unlike some other website builder services, you cannot piggy back off a free name for a while, but if you’re serious about creating a web presence, you’d have to get yourself a proper name anyway. Just make sure you’ve settled on one you’re happy with before proceeding further. Once you’re ready to start, you begin by choosing from one of the many templates on offer. You can preview them to see what they look like beyond the thumbnail representation, or click on ‘Use’ to select it. As there are so many options to choose from, it’s good to see you can narrow the search down by Category, such as Business, Portfolio, Store or Blog. Don’t worry if it’s the wrong choice: you can change the look of your pages as often as you like. Adding new content to your page is as easy as you’d expect: click on the red ‘Add Content’ circle, top of the page, to reveal a list of options such as Image, Text, Slideshow, Spacer, YouTube, Disqus, PayPal buy now, and many others. Drag the one you need over the page until a section highlights to insert it. We liked the ‘embed’ option - if you’d like to add a snippet of HTML code, to insert a Vimeo clip or an animated GIF from Giphy for instance - then this option is for you. Insert the code into it, and you’re done. Perfect. All the content you add to your page is done one section on top of another, and many offer you customisability options to make each section work as you need it to. The Slideshow for instance lets you choose its duration, whether you want it to loop automatically, show image descriptions, allow the viewer to pause playback, etc. It’s quite comprehensive. For some odd reason, we couldn’t access the free photo library. We were assured it’s present and correct and even shown a screenshot with it being available. Sadly, it didn’t appear for us - perhaps an unfortunate glitch when we were testing the service. As it stood, we could only choose photos we’d used recently, uploaded from our computer or from Facebook. You can add an image to a Text section but you can’t wrap your words around it: an image can only be above or below a paragraph of text. It also appeared as if you can’t resize the image you’ve added, but that’s because the image editing tools aren’t available in a text editor. Instead, you need to add it to an Image section, edit it there, apply filters, crop it, even change its size. This will save a new version of the photo which you can then use within your text. This is quite a complex and convoluted way of doing things which is far from user friendly. It’s a shame the tools you need aren’t available where they’d actually be needed, not forcing you to go somewhere else to use them. On the plus side, you have many text editing options, where you can change the size and colour of your content, add a background colour, add links, a divider, etc. Pretty much everything you’d expect from a text editor. Adding multiple pages is done via the ‘Pages and Styles’ menu (top left). From there you can duplicate an existing one (Fasthost refers to it as ‘cloning’), create one from scratch, reorder them or delete those you no longer need. If you click on ‘Site Design’ at the bottom of that section, you’ll find options to alter your theme’s colours to make them more unique to you and your site. You can even choose different fonts. All these changes affect your site system wide, so you don’t have to reinvent the wheel for each page you create. The blogging section is separate from your other pages and don’t count toward the ‘10-page maximum limit’ were you to choose the ‘Essentials’ package. The functionality is very similar to the Text boxes you can add to pages and which we’ve explored earlier. This also regretfully includes the frustratingly convoluted way of editing images. If you’re planning on migrating from Wordpress, you’ll be pleased to know that Fasthosts has a ‘Wordpress import’ option. You need to export your post from Wordpress first, so this is thankfully not a feature you could use to casually plagiarise others’ work. Fasthost’s e-commerce section offers you pretty much everything you need to get started, as long as you’re planning on selling physical products - this service doesn’t support digital downloads. If this aspect of online business is crucial to you, Fasthosts offers a different service called eCommerce Builder. You can create your list of products by adding them one at a time. Thankfully, there’s a way for you to import all your catalogue in one go, through the use of a CSV file. It has to be organised in a specific way though, and Fasthosts explains how to format the file to make the import process seamless. You can create discount codes, although they don’t as yet offer a time limit, but you can disable a coupon at any time manually. Shipping rates have to be created for each country you plan on doing business with - there isn’t as yet an option to group nations together so you can apply one price for them all. Instead you must input the information for each and every country which is incredibly time consuming, and you’ll have to do this again, one at a time, should the shipping costs change. So unless you limit your clients to just a handful of countries, be ready for a lot of frustration until this is sorted. As far as payments are concerned, Fasthosts supports bank transfers and cash on delivery, but you can also connect to PayPal, Point, Stripe, 2Checkout or Worldplay, giving you numerous options to start your online business. When you offer such a vast service, you expect some sort of help system, and Fasthosts do provide one by clicking on the magnifying glass icon at the bottom of the page. This leads you to a pretty long 162-page PDF. Unfortunately, it seemed to be out of date, or referred to a different service, as all the screenshots we looked at showed an interface which bore no relation to the one we were reviewing. As a result, this help feature wasn’t particularly helpful, and we hope that since they’ve been made aware of this, it’ll be fixed shortly. 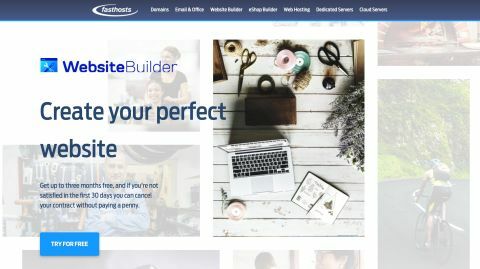 Fasthosts feels like a good website builder, and offers a lot of potential, from basic pages, to blogging and e-commerce. There are however some limitations which can really annoy potential clients, depending on their needs, like image formatting, and shipping rates. However, if your needs are simple and you can get around some of the frustrations which would hopefully be ironed out in time, you can create an effective website extremely fast. Drag and drop the sections you need, customise the interface, add videos and sell products. Everything just works.